Jerry Mthombothi, our Nelspruit Development Co-ordinator, recently spent some time with Thomas Ncongwane on his farm in the Gert Sibande district, in the Mpumalanga Province. 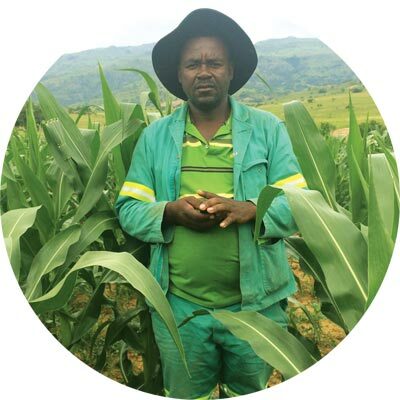 This 46 year old farmer takes farming seriously and currently farms with maize and vegetables. I farm at Brandyball on the way to Kromdraai in the Gert Sibande District of Mpumalanga. I farm on 10 hectares arable land. This year I planted six hectares of maize. I also farm with vegetables on two hectares and this year I planted tomatoes, cabbages, spinach and beetroot. I grew up with farming as my parents were farmers who farmed with both livestock and cash crops. Something that inspires me to farm is that we now use herbicides to control weeds instead of removing them by hand hoes like in the olden days. Strengths: I own 50 cows which I sell at approximately R5 000 per cow. I own 150 goats and sell them at R1 200 each. There is dam on top of the mountain and I can thus use sprinkler irrigation. Produce is purchased directly from my farm and in January 2015 I planted Eragrostis Cuvula on 1,5 hectares for my cows to graze on during winter. Weakness: I don’t have a strong market for selling my vegetables and sometimes when my products are not sold I am forced to harvest it and feed it to my livestock. I also do not have my own farming equipment like a tractor, ploughs and other equipment. When I started farming I used to harvest 2 tons of maize per hectare and now I am getting between 10 tons and 12 tons per hectare. With my spinach I used to earn between R2 000 to R3 000 per harvest but now I am earning more than R30 000 per harvest. With tomatoes I used to earn R1 500 and now I earn R20 000 per harvest. Since I joined Grain SA in 2013 I have accumulated a lot of knowledge especially on the safe use of chemicals, calibration of knapsack sprayers for application of herbicides and insecticides. I also acquired knowledge on the calibration of a planter for fertiliser application and planting correct plant population. I also attended several courses organised by the Department of Agriculture in the Mpumalanga Province. I attended Workshops, Farmer Days and courses organised by both Grain SA and the Department of Agriculture. At Grain SA I attended the Introduction to Maize Production and Tractor Maintenance course. At the Department of Agriculture I attended the Vegetable Production course. I would still like to receive training on Financial Management. In five years time I want to own a farm with its own farm equipment like tractors and implements and I want to assist other farmers to plough their arable lands. I would like to employ more people to create job opportunities and I would also like to have a direct market to sell my produce and to make sure that I produce good quality products. I want to say to the young aspiring farmers that they must take farming seriously and follow the correct production practices. Nowadays it is easy to farm because we farm with machinery like planters and we use knapsack or boom sprayers to spray herbicides and insecticides on our crops so that we can produce good quality products. It is not like in the olden days when we use to plant by hand and remove weeds with hand hoes. There is money in farming, one just needs to be patient and do everything according to the book.